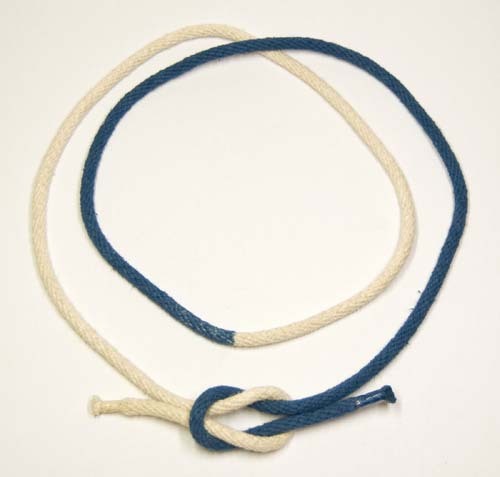 To help Cubs get started with knotting, I made up a set of ropes with one half dyed blue. This helped the younger Cubs in particular, follow diagrams and instructions, as they could more easily distinguish which end of the rope went where. I used pieces of cotton (nylon won't dye!) sash cord, 2m long. This is long enough to use to tie a bowline around a Cubs waste, but not so long that it gets in the way otherwise. I tied a piece of sticky tape tightly around the middle of each piece of rope, then suspended them (with the lower end of the sticky tape just below the water level) in a bucket of cold water dye. After dying and drying, I removed the sticky tape. After dying, I also tightly tied the ends of the rope with sticky tape (very much a poor man's whipping, but it worked just fine for the four years I used them). The Animated Knots Web site includes excellent, animated illustrations of how to tie more knots that you can imagine!